Osceola allegedly knifing the treaty of Payne's Landing, from the drawing in Andrew T. Welch's 1841 sketchbook of Seminole history, A Narrative of the Early Days and Remembrances of Oceola Nikkanoche. Florida Photographic Collection. Did Osceola really plunge a knife into the treaty? The knife-in-the-treaty anecdote was made famous by the first accounts of the war, but scholars have long debated its legitimacy. Undoubtedly the story contains elements of truth, but as a whole it may have been the fabrication of frontier historians who followed the motto, "When history conflicts with the legend, print the legend." The anecdote first appeared in Andrew Welch's 1841 account of the war. Welch's highly sensationalized narrative featured the illustration at left, along with the additional detail that the knife went through the table. 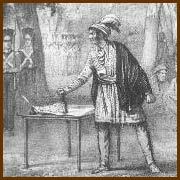 Other accounts have the knife stuck in the table but not in the treaty, the knife stuck in other papers, or Osceola simply waving the knife while angry. Wickman reviews the evidence and concludes that Welch fabricated the incident from the one credible, eyewitness account, which described Osceola gesticulating with a knife, but not stabbing anything. The legend acquired a life of its own and persists in many a contemporary account of the war. Even the National Archives affixed a note to the Treaty of Fort Gibson attesting (on Lt. Sprague's authority) that a crease in the document was made by Osceola's knife. At the very least, the story captures the essence of historical events, dramatizing the fact that after the Fort King negotiations, Osceola became the leading militant in the Seminole nation.